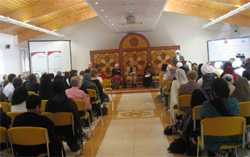 The Soho Road’s Nishkam Centre was the venue for the fourth in a series of conferences on the topic of ‘Forgiveness’ organized by the Universal Peace Federation, and the first of these conferences to be held in Birmingham. Bhai Sahib Mohinder Singh and the Guru Nanak Nishkam Sevak Jatha community generously offered to host the event. They provided all the early arrivals with a vegetarian lunch, before we moved into the second floor conference room, a very modern, elegant and spacious facility. Around 140 people attended the meeting during the course of the afternoon. Sukhbir Singh, from GNNSJ in London, gave some opening remarks to welcome everyone, and this was followed by a moving invocation from the Very Rev Peter Berry, former Provost of St Phillips Cathedral in Birmingham, highly respected for his great pioneering work in the world of interfaith, inviting God’s spirit to be with us, to hold us together and inspire us in our deliberations on such a sensitive topic. Our Chairman for the afternoon, Rev Dr Marcus Braybrooke then opened proceedings for the first of 3 sessions. He, like Rev Berry, has been one of the true pioneers of interfaith relations and activities, both in the UK and around the world, particularly through the World Congress of Faiths of which he is currently President. During the first session, we heard perspectives on Forgiveness from six different faith traditions. First was Mrs Ruth Shire from Birmingham’s Progressive Jewish Synagogue. Sharing from her faith, and her more than 90 years of worldly wisdom, she mentioned the need for forgiveness in all types of human relationships – parents and children, brothers and sisters, between races and nations, etc. The three requirements are for the offender to apologise, for the offended party to forgive, and for there to be sincere remorse and restitution. Ruth spoke about the unforgiveable trauma of the Holocaust which she can never forget – the suffering of so many victims and the inhumanity of man to man. She escaped to England and was taken care of by a Christian family. With this kind of support, Ruth was able to aspire to live a noble life, and forget the terror of her adolescence, helping her to ‘let go’ of the past trauma. The goodness and kindness of people, from different faith backgrounds than her own, encouraged her to work in interfaith and make friends from other religious and cultural backgrounds. Ruth mentioned one story of a Jewish mother whose daughter had been murdered. She visited the murderer in prison and he, witnessing the agony and grief of the mother, came to express his genuine remorse on seeing her suffering. Lastly, Ruth spoke about the Day of Atonement as a high, holy day during which the Jewish people come to reflect on the past year, seeking and hoping for God’s forgiveness, and that of family and friends if there has been hurt caused to any of them. Next, Mrs Nasim Pirmohamed spoke, representing Birmingham’s Shia Muslim community. She explained that she felt the world has lost the essence of forgiveness, and of becoming good human beings who can develop to their full potential. Saying that Ramadan would be coming soon, she described the practice of fasting as a means to try and go back to God who is all-knowing, peaceful, loving, merciful and forgiving, The need for repentance and forgiveness goes all the way back to the first family, and the blood shed between Cain and Abel, as a result of anger, jealousy and the thirst for power. In the Koran, God can forgive everything if we turn back to him and call for mercy and peace. This makes our soul go back to him. We can also manifest those same beautiful attributes of mercy, peace and forgiveness as His children. Nasim recounted 2 stories from the life of the Prophet. In the first, he was travelling to Fahid, a place full of greed, social decadence and hatred, when people began throwing stones at him. An angel came to him, saying these people should be cursed. However, Prophet Mohammed said that they were ignorant, not knowing their true value, and forgave them. Secondly, one of the Prophet’s wives saw him praying in the dark, in a corner of the bedroom in the middle of the night. He was crying out to Allah, seeking His forgiveness, saying that if he had hurt Allah in any way “May God forgive me”. Nasim posed the question ‘In a world of hatred, anger and violence, what should we do? I must check myself first and, if I sin, sincerely seek forgiveness. God will embrace us and ‘delete’ everything. I should try to leave value to society before I die, sacrificing myself for others and becoming a ‘martyr’ in the name of God. This meeting is an urgent call for peace and forgiveness. Mrs Nila Parmar, representing Hinduism, greeted everyone with ‘Namaste’, stating that we are all children of the one God. Mahatma Gandhi practiced Ahimsa, non-violence, in thought, deed, word and action. We are all on a journey back to God, through religion, knowing and reincarnation. Heaven and hell are in my life, so forgiveness is very important. Hurt and pain affects both myself and the other. If we can’t forgive, it’s a burden for both myself and the other person involved. Nila comes originally from Uganda and had to flee the country at the time of Idi Amin. She found herself in a refugee camp with her grandad in the UK, bringing only one suitcase, having lost her childhood, and leaving behind so many memories in Africa. There was nothing to go back to. Her religion teaches that it was meant to be, for whatever reason, and therefore it is important to learn to forgive and accept the situation, however difficult. Because of that personal loss, she has always tried to support children in whichever community she has found herself, to teach them the importance of coming together beyond differences, and to try and give something back to society. Nila concluded by recounting the devastating experience of losing her own father in a house fire. With nowhere to meet and receive people’s condolences, the sense of loss became even greater and she described her anger, the feeling of life’s injustice ..”How could anyone do this to us?” Over time, she came to accept that it was meant to be, but it took many years to come to terms with the loss. Eventually, Nila could teach her children to never, never blame God, no matter what tragedies happen in life. He is there to support us, and if we pray to Him, He will always be there to hold us by the hand. The fourth speaker, Yann Lovelock, from the Birmingham Maha Vihara, thanked Nila for speaking from the Dharmic point of view. As a Buddhist, he then reminded us that the concept of ‘forgiveness’ is not central to the Dharmic religions because of the understanding of Karma, basically ‘what goes around comes around’. We live in a ‘Moral Universe’ which is essentially unforgiving. This may sound harsh but, if we think about the ecological trouble we are in now for example, there is no forgiveness unless we do something about it, changing the behavior which brought about the problem in the first place. So there is no forgiveness without first of all making reparations. Yann went on to say that when someone hurts us, we can feel anger, pain and resentment, but the reality is that this is then one ego clashing with another ego. Whatever has been done to us, negative emotions are coming from us and, however unjust the situation, it is this negative response which we should address and work with first. He concluded by citing 2 examples of individuals who had managed to resolve situations where very negative feelings were involved. In the first, Adam Searle, a Quaker working in the area of reconciliation in Northern Ireland, at the height of ‘The Troubles’, was sent to arbitrate between members of the IRA and a Protestant paramilitary group. Following the killing of a Catholic, the standard response was to take ‘a life for a life’.Through considering the negative consequences of endless cycles of violence, whether taking another life, knee-capping or some other lesser crime, Adam managed to persuade both parties to not to retaliate, realizing that they would simply perpetrate what both sides wished to stop. Dr Rewata Dhamma, (described by Yann as ‘my beloved teacher’), while teaching at a university in Benares incurred the wrath of 2 jealous Buddhist monks, involving gossip behind the scenes, and stirring up negative feelings against him. Dr Dhamma employed a variation of the Buddhist loving-kindness meditation in which he would bring up the faces of the 2 monks, and broadcast intense loving-kindness to them for 1 hour each morning and again in the evening. After about a month, both monks came to him and asked for his forgiveness, because of the strength of his love towards them. Our Chairman for the afternoon, Rev Braybrooke, then gave a contribution from a Christian perspective. He began by asking us what we had felt when we heard the news that Osama bin Laden had been killed, saying that one person who had not danced for joy was Cheryl McGuiness. Her husband had been a co-pilot on the first plane to crash into the World Trade Centre on 9/11. In a very moving book, she recounted her initial desperation, grief and anger. Managing to somehow hold on to her Christian faith, she was gradually able to let go of her grief and bitterness, and find an inner freedom. A decisive moment came when she visited Ground Zero and saw 2 great iron girders in the shape of a cross, reminding her of the sacrifice and words of Jesus. On returning home, while sorting through the papers of her husband, she came across a Bible in which he had underlined those words of Jesus to ‘…love your enemies and pray for those who persecute you..’ and ‘…Father forgive them for they know not what they do..’ Mrs McGuiness describes in her book how “I could almost hear Tom saying to forgive…I felt he was asking us to forgive those who had hurt him”. Rev Braybrooke commented how those same words of Jesus have continued to inspire people who have sought to be his followers down through the ages, asking God to forgive those who carried out his crucifixion, his followers who had deserted him, the ones who had condemned him to death and, perhaps all people who are currently caught up in the injustice of this world. He used the two parables, told by Jesus, of the shepherd and his lost sheep, and the Prodigal Son to further illustrate God’s capacity to forgive. Our last speaker in this session was our host Bhai Sahib Mohinder Singh, spiritual leader of the GNNSJ community and one of the pioneers of interfaith activity coming from within global Sikhism. He began by saying that all religions have a foundation which is love, compassion. If there is no compassion, there is no religion. If compassion is the noun, forgiveness is the verb, the activity. So we need to be able to forgive, and forgiveness arises from the quality of compassion. Bhai Sahib Ji quoted from the sacred scriptures of the Guru Granth Sahib, translating a passage from the Muslim saint, Kabir, which says “…where there is knowledge and wisdom, you have religion; where there is deceipt and lies, you have sin; where there is greed you have death and destruction; and where there is forgiveness, there will be God Himself.” Forgiveness is the activity necessary for healing and reconciliation to take place, enabling people to overcome memories and legacies of injustice, conflicts and wars. In this way, they can be liberated from being imprisoned in the past, allowing the grace of the Divine to restore peace and harmony among individuals and communities. The ego (whose acronym might be ‘E_dging G_od O_ut !) can prevent us from being able to forgive others, so we need to discard arrogance and the ego, and become utterly humble. Bhai Sahib Ji concluded with the much-loved story of the Sikh who, dressed in white, carried water to the injured and dying on the battlefield, during the war of resistance against the Mughal empire, early in the 18th century. He tended to the injured regardless of which side they were on. After many complaints against him, the 10th guru summoned him to explain his actions. He replied that he saw only the face of the guru in everyone, and in his heart he was serving God. The 10th guru, Gobind Singh Ji, could say nothing against this compassion towards all and gave him ointment, as well as water, to continue his good work. On the basis of the existing Charter of compassion, Bhai Sahib Ji would like to write a Charter on ’Forgiveness’. Our second session began with an inspiring poem, composed and read to us by Councillor Faizullah Khan, one of 15 people who had made the journey up from London to participate in the conference. Following this, we heard three personal stories on the afternoon’s topic : from Mrs Prudancienne Seward who escaped the harrowing genocide in Rwanda, from Interfaith Minister David Wetton who had to deal with great personal difficulties while studying for the ministry, and from Mrs Gleen Reid who founded the organisation ‘Families for Peace’ following the tragic death of her son, and who has been doing incredible work in Birmingham, supporting individuals and families on a very limited budget. Gleen has been very much involved in counselling, helping young people to direct their energies in a constructive way in the community, and speaking in schools to warn young people about the danger of becoming involved in gangs and violent behavior. Her personal story, and those of Prudancienne and David, moved the hearts of many in the audience, and brought the afternoon’s topic into sharp focus, bringing it down to the personal level and helping us to reflect more deeply about our own lives. After a refreshment break, we divided up into groups of around 10 people and spent the remaining hour sharing our personal views and experiences of Forgiveness with one another, bringing our afternoon together to a very positive and meaningful conclusion. Many thanks are due to the organizers, Mrs Margaret Ali (UPF) and Sukhbir Singh (GNNSJ), to all the people who attended, particularly the many ladies from the Birmingham Women’s Peace Group, to the Chairman, Rev Marcus Braybrooke, and to Bhai Sahib Mohinder Singh and the GNNSJ Birmingham community who kindly hosted the event.